Philippines is indeed one of the favorite places of travelers around the globe. Manila, its capital city, is something a traveler shouldn’t miss! If you are looking for tips on what places to visit near Manila, then continue reading! Oh actually, in this blog post, we will write about affordable beaches near Manila and how to get them from Manila. A few beach destinations that you can visit on a budget from Manila. Read here where to stay in Manila! Read here our 25 Awesome Manila Tourist Spots. Click here if you want to get your discount booking activities in Manila with Klook! If you don’t know, Philippines has only 2 seasons- wet and dry season. You should be prepared with the weather in Manila because it is hot and humid during the months of March to May, and can extend up to June! The wet season starts from June to November. But due to climate change (which affects Philippines the most), rainy season can start as early as May. The best time to visit Manila during the month of January, as the weather is expected to be the coldest of the year plus you won’t compete with the locals during December’s holiday rush (traffic and all). It depends on your preference after all.  You can click here for updates on accurate weather in Manila. You can also get AirBnB for $30-40 USD per night. Click here to get a discount on your first booking! Click here to get the best deals and to book your accommodation with Booking and Agoda. Click here for discounts and book more activities in Manila and click here to get your discount booking at Manila Ocean Park! In Anilao the water was so beautiful- blue, transparent, and calm. It was perfect for snorkeling and diving. We actually tried snorkeling in Anilao and the experience was great. Snorkeling was one of our favorite things to do in Anilao. From Manila, there are buses leaving for Batangas regularly. You can board the buses from Alabang, Buendia or Cubao where there are hourly trips to Batangas. It takes approximately 3 hours to reach Batangas and costs around 150 PHP. Upon arriving in Batangas, there are several ways to reach Anilao. One option is hiring a tricycle for 300 PHP ($6 USD) for a 40-minute ride. Another way to get to Anilao from the bus terminal is to ride a jeepney. It costs 35 PHP per person to reach the municipality of Mabini’s market, then you can take a tricycle to your resort. Read here for more cool things to do in Anilao. This is one of our favorite hotels in the Philippines. From our room with views that were dreamy to the clear water and the islands on the landscape, we loved everything! We had a day trip to the island and from Anilao, you can get there at around 15-20 minutes by boat from Eagle Point Resort (it´s their private beach). The island was so quiet and really beautiful There was no place for staying but you can have your lunch and relax there. They have everything you need. First you need to get to Anilao, you can read above the information. Once you are in Anilao there are boats leaving to Sepoc Island from Eagle Point Resort. Ask the schedule and prices and the ride will last 20 minutes. Subic is located in the province of Zambales. It’s only 3 hours drive from Manila. Subic is a free port zone that was built during the years the Americans colonized the country. Subic is small, peaceful and quiet. It’s a great place to walk around. You can see a mix of local people with foreigners living there. In Subic, the sunsets almost never disappoint. We took magical shots every trip that we did in Subic! From Manila you can get a bus from Cubao, Earnshaw, Pasay and Caloocan going to Olongapo. Victory Liner buses are going there and the fare is 270 PHP. Once in Olangapo you can move around by jeepney or tricycle depending where are you going to in Subic area. If you want to go to Subic by jeepney from Olongapo ride the jeepney until SM City Olongapo Mall and from there you can go walking to Subic free port area. The Lighthouse Marina Resort features an outdoor pool and views of the sea. Guests can enjoy the on-site restaurant. Every room at this hotel is air conditioned and features a flat-screen TV with cable channels and DVD player. All rooms are equipped with a private bathroom fitted with a bath. For your comfort, you will find bathrobes, slippers and free toiletries. You will find a 24-hour front desk at the property. Rate starts at 7,700 PHP. Click here to check their rates and availability. Read here things to do in Subic! Capones Island is next to Camara island and also an eye view from Pundaquit beach. It’s ideal for lunch or staying a couple of hours swimming, overnight or even trekking to the lighthouse. It’s a good place to spend a few hours, especially if the water is calm. Read here if you are planning to do Island Hopping in Zambales. If you go on a budget and you want to have an amazing experience, you can camp in the beaches in Zambales. You have a bigger space for swimming than in the other beaches in Zambales and the water is so calm in this cove. There is a forest and a lake behind. The beach is popular for camping especially with the locals. There is a fee if you’ll stay overnight for 100-150 PHP. You can pitch your tent or renting in Anawangin Cove. There is no electricity in and no phone signal in Anawangin so it’s the perfect place for disconnecting to the real world! To reach Anawangin Cove from Pundaquit beach will take 30 minutes and if you go only to this beach a small boats for 4 people can cost 1000-1500 PHP. It’s great to stay overnight camping, make sure you bring food, power banks since they aren’t selling food and there is no electricity. There are a few options like Airbnb, hostels and hotels. If you want to sign up for Airbnb, we give you $30 USD credit with your first booking! Visiting Nasugbu, Batangas is definitely underrated compared to the more popular destinations in the Philippines. It’s beauty is also incomparable. 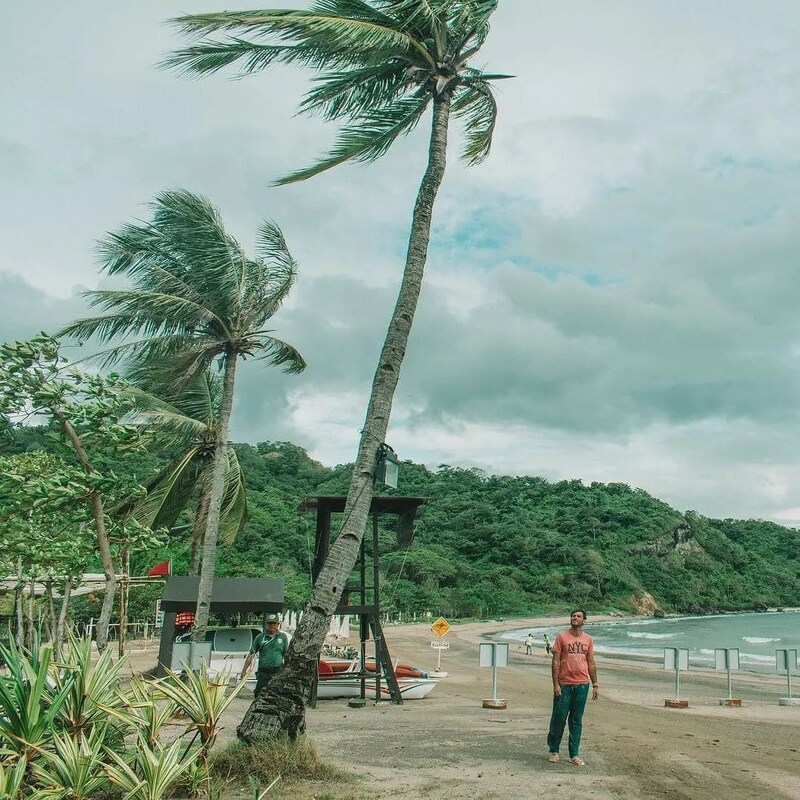 Like what we’ve shared in our previous Batangas Travel Guides, Nasugbu, Batangas is one of the most beautiful places you can visit in the Philippines. Only a few hours from Manila, there are many things to do in Nasugbu. You can dive, swim, snorkel, do island hops and do amazing trips in Nasugbu, Batangas. To get to Nasugbu from Manila you have to ride a bus from Buendia or Pasay. It will take 3-4 hours depending on the traffic and it will cost around 160 PHP. With the many hotels and guests houses we’ve already stayed in, by far Pico Sands Hotel has the best eye for details. For this trip, we were traveling with a child, and right in our room, they prepared small gifts (toys for the beach and stuffed animals). Nearby the hotel, you have the views of the pool, the big lagoon, the condominiums and the very beautiful scenery in the middle. We spent time with the ducks, played in the bridge, and had so much fun walking around so much greenery. Ready for more adventure and to really experience the Boracay and its picturesque beaches? The White Beach is really good for sunset, restaurants and bars. You can discover various scenes that are perfect for photography, or really, just perfect for you to take it all in. There are of course other water activities available, like the kite sailing. Whatever your jive is, there is something that will keep you active and having fun in the island. Not too hard with the beautiful views! Read here all the things to do in Boracay Island! Boracay is just an hour by plane from Manila which is why it’s a very popular quick getaway for locals who are mostly coming from Manila. What do the locals and even foreign people see in Boracay that makes them always come back? You can also go by ferry from Batangas, there are night ferry going to Boracay. We enjoyed our stay in Ferra Hotel. The local vibe, nicely mixed with modern style was a nice touch. The rooms were big enough and we really loved the common areas. The best asset of the hotel is definitely its people, which of course, is what everyone talks about. They are the friendliest and most courteous staff we’ve met so far, with great attention to details. Everyone in the whole hotel is naturally friendly, and you can see that it’s really part of the hotel’s culture, and just makes your stay a hundred times easier, much lighter and happier. A perfect addition to the Boracay paradise! Click here to book your accommodation with Booking and Agoda in Boracay Island. Hundred islands Natural Park in Pangasinan is a group of islands 123 and they are quite popular for Filipinos especially in the weekend. It could be done in a long day trip from Manila and you can stay overnight. We recommend you to start your island hopping in Hundred Islands first thing in the morning to maximize your day. Read here our full Hundred Islands Travel Guide! If you are coming from Manila, you can ride a bus to Alaminos. Victory Lines has routes from Manila to Alaminos the fare is 400 PHP and travel time is around 4-5 hours depending on the traffic. There are buses running from Cubao anytime of the day. Once you are in Alaminos you have to get a tricycle is around 5-6 kilometers to reach to the tourism information center in hundred islands. The fare of the tricycle is 100 PHP and you can share if you are riding with more people. You can do overnight camping and there are a few resorts in the main islands. For our staying with chose Airbnb in Alaminos. You can also look for accommodation around Alaminos town. Why we can recommend to visit Puerto Galera? If you want to relax this is your place in the Philippines. It’s not very far if you are staying in Manila. Puerto Galera is famous for diving and snorkeling and it was good. . There are different beaches depending what you are looking for. Puerto Galera is also a famous place to go to if you want to try diving. There are available diving lessons and diving activities you can opt to avail. Other water activities such as snorkeling, jet skiing and kayaking. Of course, island hopping is another popular activity since there are other smaller islands surrounding Puerto Galera that you can go to and explore. There are also inland places and attractions you can go to like the Tamaraw Falls and visit the local Mangyan Village at the foot of Mt. Malasimbo. Read here our favorite things to do in Puerto Galera! If you are in Manila, you will have to ride a bus to Batangas port for 2-3 hours depending of the traffic. If you go in the weekends or first thing in the morning you will make to Batangas in a couple of hours. Prices for the bus costs $4. And once you are in Batangas you have to ride a boat to reach Puerto Galera an hour or so. Prices for the boat is $5-6. Once you ride the boat from Batangas, you need to do small payments for ferry terminal (half dollar) and also enviromental fee for maintenance of the island ($1-2). Featuring a garden and a terrace, Grace Hotel is located in Puerto Galera. With free WiFi, this 2-star hotel offers a shared lounge. Every room is equipped with a balcony with mountain views. At the hotel, the rooms come with a closet. Every room has a private bathroom with a shower. Guests at Grace Hotel can enjoy a continental breakfast. A room can cost 960 PHP or less than $20! There are buses going from Cubao and Buendia to Batangas City. It will take 2 hours and the price is around 160 PHP. From Batangas city you have to go to Tabangao Port. If you go by tricycle it will cost 300 PHP good enough for 3 people. It’s 100 PHPeach and if you do by jeepney you will pay 30 PHP. You have to take one jeepney 12 PHP to Bagong Palengke and from here to Tabango Port and it will cost you 19 PHP. From the port there is only one boat at 9 am and it costs 120 PHP. If you don’t reach this boat you will have to pay for a private boat. So make sure you join more people if not can be expensive around 2000 PHP. There are a few resorts and homestays in Isla Verde if you want to stay overnight. But there is no electricity at night only from 6 pm to 10 pm hours. And there are also a few places to stay in Batangas City if you want to have more comfort. Click here to check the best deals in Batangas! There are buses going from Cubao and Buendia to Batangas City. It will take 2 hours and the price is around 160 PHP. From Batangas city you have to go San Juan by jeepney or by van. Once you are in San Juan you can get to Laiya Beach by tricycle. There are a few resorts in the beach and also you have the opportunity to go back to Batangas City if you wish. Click here to check the best deals in Laiya Beach! You have to ride a bus to Lucena City prices around 260 PHP and the travel time is 3 hours. Once in Lucena you have to take a local bus to Unisan around 40 PHP and 1 hour and 30 minutes. Once you get to the bus stop you have to get a tricycle to Aplaya. You can do overnight camping in Borawan Beach or if you want more comfort there are few places to stay in Padre Burgos. Click here to get the best deals! You have to ride a bus to Lucena City prices around 260 PHP and the travel time is 3 hours. Once in Lucena you have to take a local bus to Maluban around 70 PHP and 2 hours travel time. Once you get to Maluban, you have to ride a boat 100 PHP to Cagbalete Island. There are a few resorts that you can stay at Cagbalete Island. Just choose the one which is adapting better to your budget and comfort. Buses going from Cubao will cost around 350 PHP to get to Morong via Olongapo, travel time is around 3 hours. Once you are in Morong ride a tricycle to Morong Beach. There are a few resorts to stay around Morong Beach. Click here to get the best deals in Morong Beach! What do you think about these 15 Affordable beaches near Manila? Did we miss your favorite beach near Manila? Let us know in the comments below.